Krister Holmberg is Professor of Surface Chemistry and Director of Materials Science Area of Advance at Chalmers University of Technology in Göteborg (Sweden). He was awarded a PhD at Chalmers University and after gaining his doctorate, he worked as a researcher at a number of Swedish chemical companies. From 1991 to 1997 he was head of the Surface Chemistry Institute, Stockholm (Sweden). He was also adjunct professor at Göteborg University in Biotechnical Surface Chemistry and at the Royal Institute of Technology in Technical Surface and Colloid Chemistry. Professor Holmberg's current research interests include novel surfactants, organic and bioorganic reactions in organized media such as microemulsions and suspensions of mesoporous materials, and controlled delivery of active substances. Professor Bengt Kronberg is a Senior Research Fellow and Course Director at SP Technical Research Institute of Sweden. He has a long experience in teaching fundamental and applied aspects of surface chemistry. He has published over 80 papers in the field and is a co-author of the book "Surfactants and Polymers in Aqueous Solution". 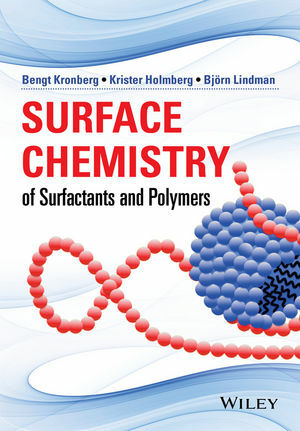 Professor Kronberg supervises research in the fields of microemulsions, adsorption of surfactants and polymers, fuel formulations, and polymeric networks. Professor Björn Lindman is senior scientist at the Department of Physical Chemistry, University of Lund, Sweden and Visiting Professor at School of Materials Science & Engineering at Nanyang Technological University, Singapore. He has published more than 600 papers, and co-authored three books and edited more than ten books in the field of surface and colloid chemistry. Furthermore he is a well-known lecturer and consultant worldwide. Professor Lindman's current research projects include: DNA gel particles and cross-linked DNA gels, Controlling the phase behavior of polyion-surfactant ion complex salts by cyclodextrins and associative effects of polyacrylates in surfactant systems.